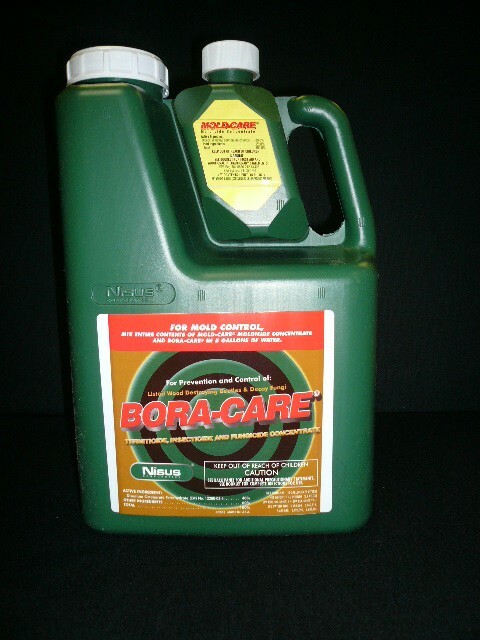 PRODUCT DESCRIPTION:Bora-Care® is a concentrate that must be diluted with clean water before use. The use of warm or hot water, if available,and an impeller-type mixer that can be used with an electric drill aids the dilution process. Bora-Care® is an innovative termiticide, insecticide and fungicide that provides long term protection against: Brown Rot (including dry rot), White Rot, Wood Decay, Molds and Other Fungi. It kills and prevents all molds, provides residual protection and creates a buffer zone, delaying effects of major flood damage. Bora-Care with Mold-Care is a spray-on application that is applied to wood by your pest control company. Bora-Care with Mold-Care kills existing mold and helps prevent mold from growing in the future. Specifically designed to work with Bora-Care, Mold Care prevents the establishment of dry rot, wet rot and mold. Bora-Care adds additional residual protection against decay fungi and insect infestation. Bora-Care with Mold-Care can be applied to bare wood, plywood, particleboard, drywall and OSB. And it’s the best approach you can take against mold. Bora-Care with Mold-Care is designed to penetrate wood; it doesn’t just remain on the surface, but is absorbed into the interior of wood to protect it from the inside out. TARGET PESTS: Powder post beetles, termites, carpenter ants, decay fungi, old house borers and basically any type of insect which wants to eat wood. It also has the added feature mold prevention when the Moldcare is added to the mix. WHERE TO USE: New Construction, Water Damaged Materials, Apply to whole house or high-risk areas such as kitchens, bathrooms and crawl spaces. A. Hand Sprayers: Mix in a clean container and stir the solution until completely uniform. Always mix in a separate container then add the solution to a spray tank. Mixing Bora-Care® solutions directly in a spray tank can block hoses and nozzles. B. Hand Volume Pumping Systems: Add all of the dilution water to tank, start recirculator, then slowly add Bora-Care® and Mold-CareTM Moldicide Concentrate concentrates. Mix until uniform. The solution will remain stable for up to 30 days. Do not leave unused solution under pressure or in tank overnight. Clean and/or flush equipment and lines with water after use.